If you are localizing JSON files using Passolo 2016, they’ve added a feature that you may be unaware of. With this new functionality, JSON parser in Passolo can now automatically recognize and handle RESJSON-style comments. If appropriate comments are visible right next to the string waiting to be translated, a great deal of time can be saved on guessing, writing and answering queries. Why be so enthusiastic about the RESJSON format? In previous versions, the JSON parser available in Passolo could recognize and handle C-style comments, but, unfortunately, those comments caused the JSON files to be invalid. My team faced this dilemma when managing software localization projects at Pitney Bowes. 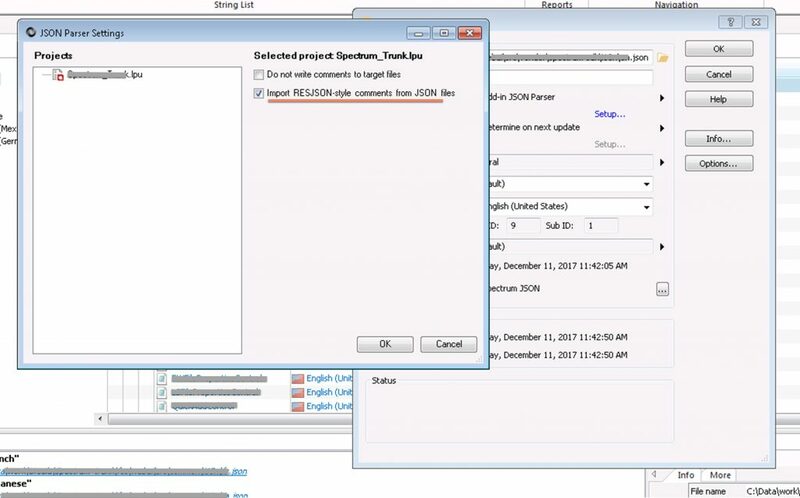 The SDL community experts initially suggested that we try maintaining two separate versions of each JSON file — one valid and one commented — but this would present a huge burden. Imagine handling almost a hundred JSON files along with thousands of files in another format. The suggestion was not viable, to be honest. At this point, I wanted to add comments in the RESJSON format, knowing that this wouldn’t break the JSON file. It would remain fully usable. Unfortunately, this wasn’t supported by Passolo. So, we came up with a workaround: creating a substitute Text Parser. This did the trick, but still wasn’t ideal because it didn’t support the hierarchical structure of JSON format. We were able to include the nested parts of the content, but we missed the beautiful tree structure in the left-hand panel. I continued reaching out to the SDL community for a better solution, and they initiated an enhancement request. They then added this new functionality to Passolo in the 2016 release. This update is mentioned in the release notes, but I haven’t seen it advertised anywhere. At that point, you’ll see the JSON Parser Settings window where you can check the “Import RESJSON-style comments from JSON files” option. And that’s when the comments will be properly recognized and handled. (Word to the wise: try not to have multiple projects opened when you do this, because due to how the settings window is designed, you may inadvertently change the settings in another project). Ok, now you’ve got it. I hope you’ll find this feature as useful as we have. Piotr Dąbrowski is a globalization program manager at Pitney Bowes. He began his career as an in-house translator and proofreader. Now, he oversees the process of internationalizing, localizing software and translating documentation for certain Pitney Bowes products.